Don’t Let the Bedbugs Bite! You can’t scroll the internet or listen to the news without hearing about the harsh reality of bedbug infestations in hotels, planes, theatres, campuses, hospitals and office buildings. This public health issue is quickly becoming a global crisis with sightings of these creepy critters from most U.S. cities to the far reaches of Mumbai, India. However, there are several measures you can take to minimize the risk of bedbug bites and infestation. Some include: checking your hotel mattress and keeping luggage away from soft bedding or upholstered furniture so you don’t transport the unwanted guests back home. Yard sale aficionados need to think twice about snagging upholstered sofas or chairs left at the curb. These tips may help to minimize your exposure to bed bug bites and property infestation. What happens if you do have an infestation? Will insurance pay the costly expense to eradicate the pesky pests? Unfortunately, insurance usually isn’t the answer here. Most policies exclude insect infestation of any kind and do not include any coverage. “…The cost of getting rid of bedbugs, like other vermin, is considered part of the maintenance associated with owning a home and generally is not covered by standard homeowners’ and renter insurance policies,” wrote Claire Wilkinson, Vice President for Global Issues at the Insurance Information Institute; “Most standard commercial-property insurance policies also have vermin exclusions for infestation”. Most seasoned insurance agents will agree that insurance property coverage forms clearly exclude coverage for bedbug treatment; however, liability coverage may be a different bug story. 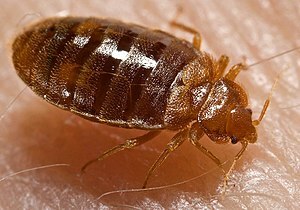 Ever think what would happen if a guest is bitten by a bedbug at your home? Or perhaps your child has a sleepover and a young guest is bitten, resulting in infection and ongoing medical treatment. Before you know it, you are being sued by the parents for negligence as a result of harboring the bloodthirsty buggers. The good news is most homeowners liability policy forms do not exclude insects so there is probably liability coverage for this kind of lawsuit.. The same is true for commercial policies if the policy form does not specifically exclude insects. In addition, many businesses have coverage under business interruption forms if the need to close their business to properly exterminate the creepy crawlers arises. Insurers may end up feeling the bite from bedbugs in other ways. New York state legislators became the first state to introduce a bill that would require bed bug coverage as an option for policyholders. If NY passes this law, look for other states to follow suit. It will be an interesting few months in the insect and insurance world as the globe grapples to safely avoid a 21st century plague. And for more relevant and topical insurance information, visit the A. G. Gordon, Inc. Website.